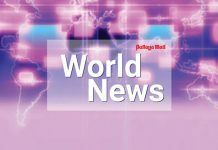 New York (AP) – From a preschool toy designed to teach pre-coding skills to a hands-on molecule-building set for older kids that works with an app, technology abounded at this year’s Toy Fair. The annual showcase of upcoming toys held recently in New York included a slew of tech-related products from the titans of the toy industry and tiny startups, all looking to attract increasingly tech-savvy kids. Here are the highlights. Some of the toys are educational, while others are just kind of cool. All of them are set to go on sale this fall unless otherwise specified. Even preschoolers can learn the basics of coding. That’s the idea behind this toy, which is aimed at kids ages 3 to 6. 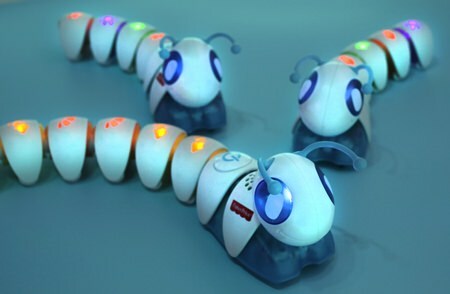 The Code-a-Pillar is made up of different colored sections connected by USB plugs. The sections perform different commands such as go straight, turn right or make various sound effects. Kids “program” the toy by connecting the various sections in a particular order. While the toy doesn’t teach an actual coding language, it does try to impart some of the same critical thinking and problem solving skills that coding does. A starter kit includes eight sections, but expansion packs featuring additional commands will be sold separately. Created through a partnership with Autodesk Inc., a 3D design software company, kids use an app to design items such as action figures and jewelry. They can choose the colors and shapes they want, then send their design to the ThingMaker to print. The app shows them what their finished product will look like and also gives an estimated print time. 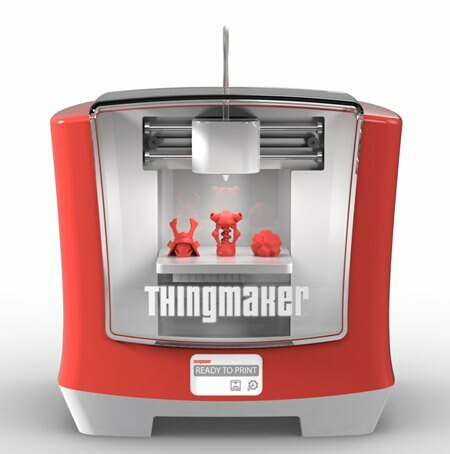 The ThingMaker hits stores this fall, but can be preordered through Amazon. Pricing for the spools of plastic used in the printer has yet to be determined. These kits teach science by combining hands-on and app-based activities. Happy Atoms, for kids ages 8 and up, involves building molecules with wooden atoms that connect with magnets. The atoms become “happy” when they pick up the appropriate number of electrons through the formation of molecules. The molecules can then be scanned into the app, which gives the kids information about the substance they just made. Pricing for Happy Atoms has yet to be determined. Meanwhile, CodeGamer, ages 10 and up, connects physical and digital play to teach coding skills. Kids solve video game puzzles by both programing the game on a tablet and by physically modifying a Bluetooth-connected controller. These circuit builder sets are specifically designed for young children. The blocks, which look a lot like dominos, connect with magnets and are easy for little hands to manipulate. The company offers three sets of 26 blocks, each with a separate theme: music, circuitry and spy. There’s a tablet app to go with each set, which tells a story, prompting the kids to build certain kinds of circuits. MakerBloks, designed for kids 6 and up, launches this summer and will be sold through the company’s website, though talks with retailers are under way. This toy, designed for kids ages 10 and up, combines a handful of the hottest trends, including drones, app-based gaming and augmented reality. Players place the quad-copter drone on a mat that “sees” it and places a digital version of it within an augmented reality video game played on a smartphone or tablet. 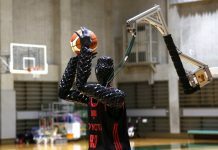 The player flies the physical drone as part of the game and the digital drone on the smartphone or tablet screen mirrors its movements. CHiP is was one of several products at Toy Fair controlled by a wristband worn by the user. 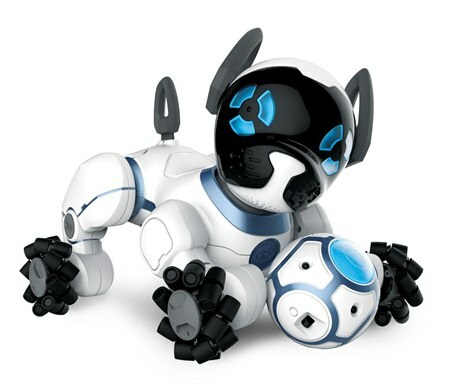 The connection allows the little robot dog to follow his owner around, play soccer and do other tricks. The more it’s played with, the more tricks are unlocked. Sensors allow CHiP, designed for kids ages 8 and up, to zoom around while avoiding obstacles. And when he gets tired, the little pup will automatically retire to his charging bed for more juice. This toy lets kids create and share their own pop music videos. It’s basically a selfie stick with a microphone on one end. It comes with an earpiece and works with a smartphone app. 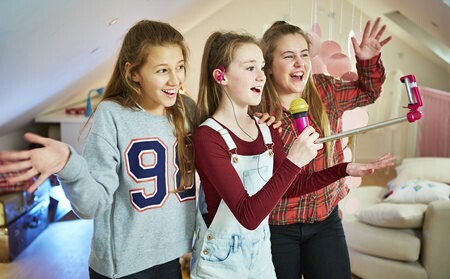 Kids sing into the microphone, while the smartphone app plays the music and the smartphone’s camera films them singing and places them into the music video. There are optional sound and video effects and the videos, which don’t need to be stored on the phone and take up space, can be shared.